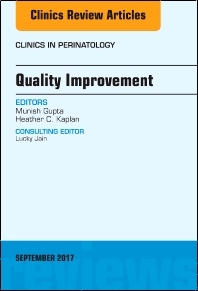 Foreword: Quality Improvement: The Journey Continues! Has Quality Improvement Really Improved Outcomes for Babies in the Neonatal Intensive Care Unit? The Guest Editors have collaborated on a state-of-the-art presentation of current clinical reviews on Quality in Neonatal Care. Top experts have prepared articles in the following areas: Standardizing Practices: How and why to standardize, using checklists, measuring variation; Health Informatics and Patient Safety; Using Statistical Process Control to Drive Improvement in Neonatal Care; Improving Value in Neonatal Intensive Care; Culture and Context in Quality of Care: Improving Teamwork and Resilience; Has Quality Improvement Improved Neonatal Outcomes; National Quality Measures in Perinatal Care; Perinatal and Obstetric Quality Initiatives; Family Involvement in Quality Improvement; Perinatal Quality Improvement: A Global Perspective; Delivery Room Care / Golden Hour; Respiratory Care and Bronchopulmonary Dysplasia; Reducing Incidence of Necrotizing Enterocolitis; Alarm Safety and Alarm Fatigue; and Patient Safety: Reducing Unplanned Extubations. Readers will come away with the clinical information they need improve quality in the NICU.